Looking for a dedicated free diving Apnea Computer? The Suunto D4F Freedive Apnea dive computer has all the functions freedivers, spear fishermen and snorkelers need. This review looks into the D4F freediving watch, it's functions, and what it's missing. If you already know the Suunto D4f is for you, click the button to see the current price, and any savings available on Amazon. What are the differences between the Suunto D4F and the D4i Novo? Why do Free Divers and Spear Fishermen need a Dive Computer? What doesn't the D4F have? Before Suunto released the D4F, their only watch sized dive computer in this mid-range was the D4i Novo. The D4i Novo had long been a very popular choice for scuba divers, free divers and spear fishermen. Suunto have taken away the Scuba decompression functionality in the D4F. This has greatly reduced the price in comparison. The D4F is around half the price of the Suunto D4i Novo. There are additional savings on top of this when you buy online. The Suunto D4F is easy to operate and logically designed. The Suunto D4F and the D4i Novo are both watch-sized dive computers. The D4F is lighter than the D4i Novo, and comes with an elastomer strap. Suunto's D4F is a dedicated Free diving dive computer. This will only display settings appropriate for free diving. The D4F doesn't show or have the capability of displaying any decompression information. This is reflected in its price. The case of the D4F is a composite material keeping it lightweight. It has a stainless steel bezel and mineral crystal glass display. 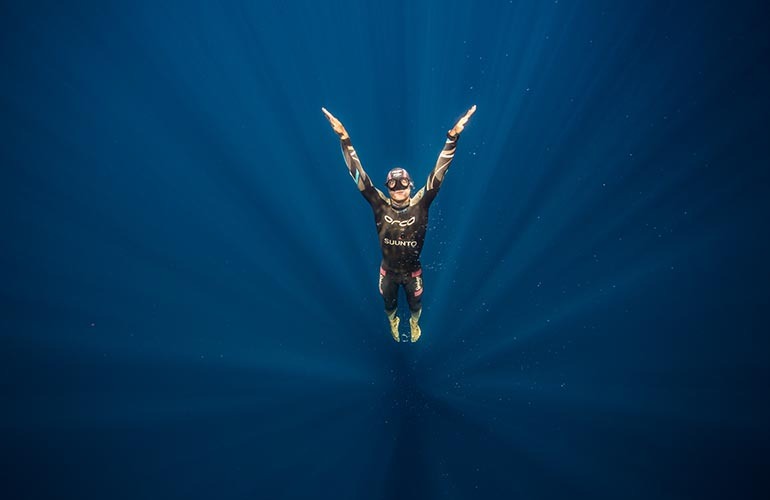 The need to understand how to dive deeper and safer has become increasingly important to many in the free diving and spear fishing community. Just like scuba divers, the repetitive descent and ascent from different depths during free diving will cause nitrogen to load into your system. Sometimes rapid ascents can contribute to decompression sickness. 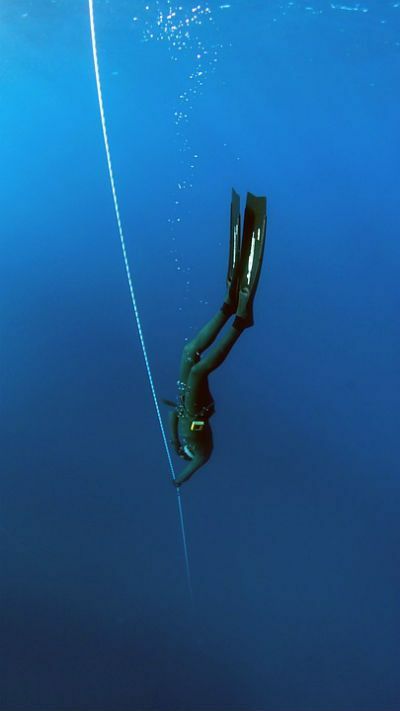 A dive computer combined with basic free diving techniques will take a lot of the guesswork out of diving. This leads to more relaxed and safer dives. The Suunto D4F displays your current and maximum depth. It also calculates dive times and surface intervals for you. The duration of the Backlight can be set to 5, 10, 20, 30, or 60 seconds. The backlight can also be turned off completely. The Apnea Timer can be used for internal training when free diving. The Apnea Timer will help to improve your breathing technique. After each dive you can look and analyze dive information from the logbook. The Apnea Timer allows you to adjust the ventilation time, increment time and the number of intervals. It supports up to 20 intervals. This is dependent on the ventilation and the increment times. The last ventilation cycle can't be shorter than 0:05 seconds or longer than 20:00 minutes. 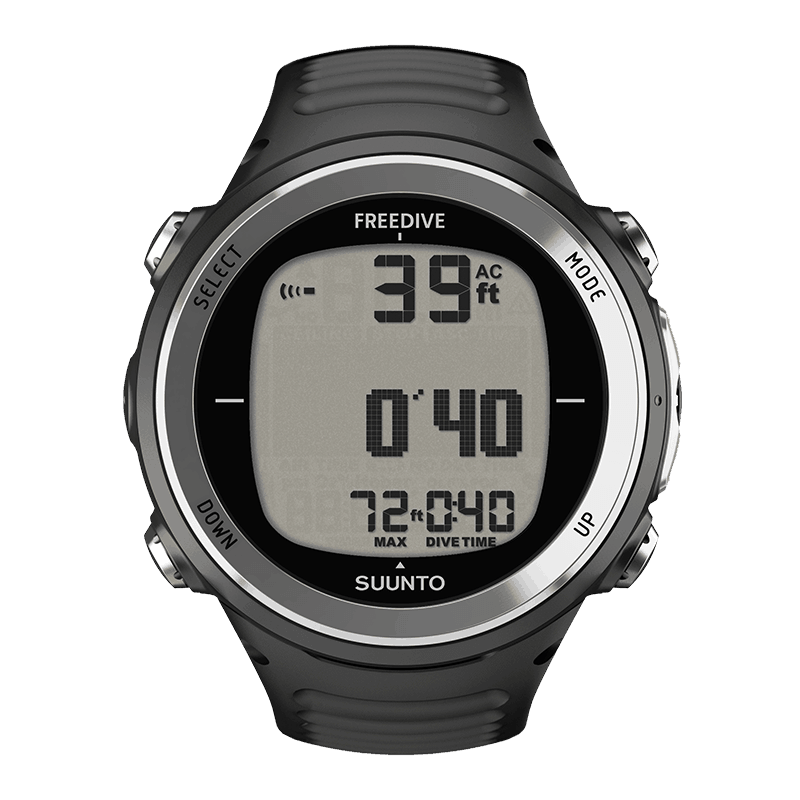 The Free Diving functions all available in Free mode of the Suunto D4i and D4i Novo are also available on the Suunto D4F. The D4F displays the current depth, surface time, maximum time and dive time settings. The maximum operating depth is 328 feet (100 meters). The dive computer records a maximum of 99:59 diving hours and 999 dives. The true depth is recorded by sampling the current depth 3 times a second. The sample rate can be adjusted to record once every second. A visual alarm activates when the defined depth is reached. The Depth alarm can be set to give out a warning if you go deeper than expected. This is ideal for blue water hunting and equalizing at depth. Equalizing at depth is used in depth training and Free Diving competitions. The duration of Surface time until the next dive will also be shown. There is a Surface Countdown Timer to help you prepare for your next dive. The countdown starts as soon as you reach 4 feet (1.2 meters). Being a dedicated free dive computer so it doesn't show or have the capability of displaying any decompression information. This is great for keeping the costs low. Similar to the Suunto D4i Novo, the D4F doesn't come with the USB Cable. The USB cable is needed if you want to upload your dives to Suunto's DM5 or upgrade the firmware. This remains an accessory at an additional cost. The battery of the new Suunto D4F is not rechargeable. The Suunto D4f Black is a specialized version of the popular Suunto D4i dive computer. It has all the essential features for free diving. The Suunto D4F Apnea diving computer is simple to use, and it's easy to navigate the menu. Once you're back up on the surface, the DF4 also shows interval time and the length of your last dive. The screen is clear and easy to read. It's extremely easy to turn the settings on and off again as you switch between free diving and spear fishing. 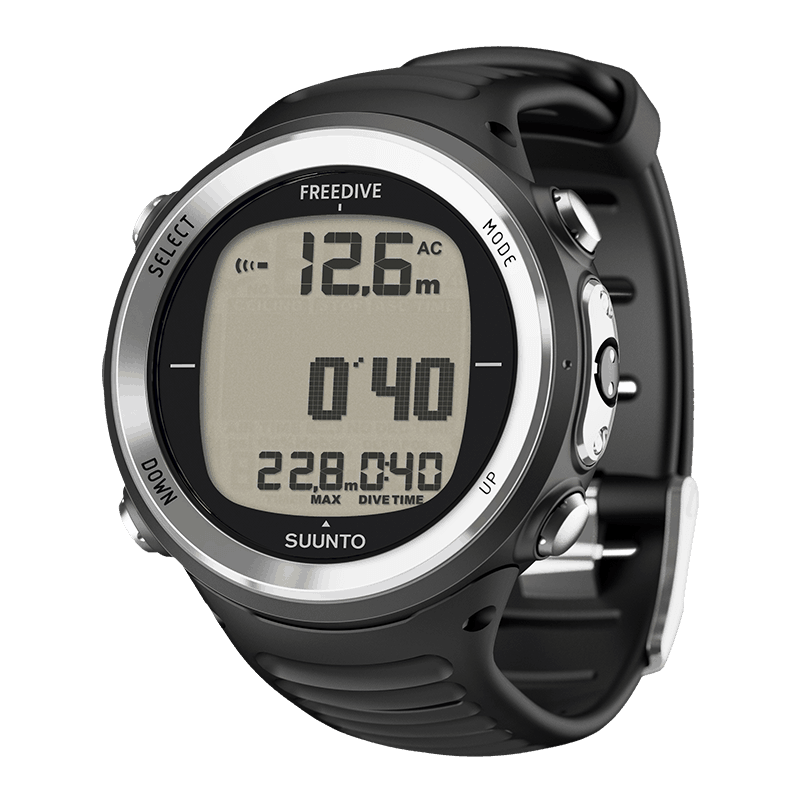 At around half the cost of the Suunto D4F, this is a real alternative for free divers. Other dive computers in the Suunto range that have a Free Dive mode include the Vyper Novo, and the D6i Novo, and theD4i and D4i Novo. Terry has dived in all states of Australia, off the island of Tortola in the British Virgin Islands, Papua New Guinea, Fiji, Palau, Truk Lagoon, Belize C.A. and numerous places throughout the Caribbean. He's pretty much dived wherever there was water deep enough to dive in.